The following Mile-by-Mile Guide has been excerpted from California Whitewater, a whitewater rafting guidebook written by Jim Cassady and Fryar Calhoun. Mile 0.0 - Put In: Put in on right (south) bank of Cherry Creek just below the bridge, or at a primitive campsite on the opposite bank. 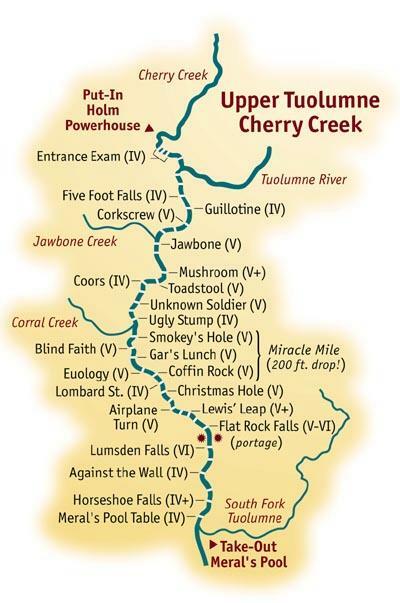 Most of the Tuolumne's flow after mid-summer is released down Cherry Creek from the powerhouse, so boaters put-in on the Creek and float a mile of continuous Class IV rapids down to the river. Mile 1.0 - Confluence of Cherry Creek and the Tuolumne, which enters from the left. Mile 2 - Corkscrew (Class V): A horizon line across the river marks the top of the rapid. Avoid an undercut rock at the left bottom. Scout on the left. Mile 2.4 - Jawbone (Class V): Jawbone Creek enters on the right. Boulders block the river channel. Scout on the right. Mile 3.2 -3.4; Mushroom (Class V+): The rapid begins just beyond a sharp right turn. Scout left. In the first 50 yards the river falls 30 vertical feet as it tumbles over ledges, into holes , and against a huge flake of rock that has split away from the right wall. The flake divides a sharp vertical drop onto a great foaming boulder. Just downstream a final Class V vertical (also called Toadstool) splits around another big rock that catches a lot of current. An eddy on the left just below this final drop is hard to escape. Downstream, half a mile of Class IV boulder gardens that can be seen from the road continue to the next big rapid. Mile 3.9 - Catapult (Class V): Also called Unknown Soldier. As a cable crosses the river and the road comes into view high on the right bank, the Tuolumne surges through a rocky slalom leading to a sharp drop down a right-hand chute. Scout this final drop, either from the right bank before you start down the rapid or from one of the small eddies on either side just above the drop. Mile 4-5; Miracle Mile (Class V): Continuous action as the river drops 200 feet in a mile. A big gulch on the right (mile 4.3) announces "Just A Slalom" (also called Gar's Lunch), a brutal quarter-mile boulder garden laced with steep drops. The worst ones are near the top, so a mistake could lead to a nasty swim. Scout right, then enter left and think fast. Around mile 4.7 comes BLIND FAITH, a steep rough chute leading to a tiny pool. Then the current piles into COFFIN ROCK. Most boaters avoid it by running a drop on the far right behind a large boulder. Scout on either side. Mile 5-6: Another mile of continuous Class V whitewater: first a boulder slalom; then a wide, shallow rock garden; next a series of wrap rocks. Near the end of the stretch, the river turns right, and boaters should stop to scout "Christmas Tree Hole", an eight foot vertical drop downstream. Whitewater continues to the lip of the falls, so don't wait to long to eddy out. Mile 6.1 - Airplane Turn (Class V): After flowing through a large pool, the river turns left and drops into a hole that has held boats for a minute or more. Scout on the right. Mile 6.4 - Lewis's Leap (Class V+): Also called "Number 2". Boaters must negotiate some sharp drops and maneuver around boulders to have the privilege of making the leap into a huge, river-wide hole. Amazingly, most boats emerge upright. No guarantees. Scout on the right. Mile 6.7 - Alternate Take-out: Boaters often take out above Flat Rock Falls, but it's a very difficult task. Choose between scrambling up a steep embankment to the road on the right, or carrying gear out via a long trail on the left that isn't very steep but is laced with poison oak. Mile 6.8 - Flat Rock Fall's (Class V-VI)=Possible Portage: A technical boulder garden leads to a ten foot falls onto a severely undercut rock. Boaters trapped in the reversal could drown. This drop should be portaged at most flows. Some boaters flirt with disaster to reach a slightly less intimidating vertical chute on the right. Scout either side. Portage (a tough one) on the left. Mile 7 - Lumsden Falls (Unrunnable)=Portage or Alternate Take-out: Look at this one from the bridge. You may think you see a way down this long, turbulent rapid's shelves and ledges, but don't even think about testing your theory. For the record, though, we have heard of three successful runs of Lumsden Fall's--two by a paddle raft crew from Texas, and one by kayaker Gordon Patchin in 1983. Mile 7.1 - River Access; Lumsden Bridge: A Forest Service campground just downstream sometimes serves as a put-in. Mile 7.5 - Against the Wall (Class IV): A blind right turn leads to a big hole in the middle of the river. Mile 7.7 - Horseshoe Fall's (Class IV+): A staircase rapid similar to Clavey Falls (further downstream on the main Tuolumne). The second drop is the biggest. Scout from the island on the right. Mile 8.3 - South Fork of the Tuolumne enters on the right. Mile 8.4 - Lumsden Campground (river left): Kayakers sometimes take-out or put-in here. Mile 8.5 - Meral's Pool Table (Class IV): A rock garden. At lower flows watch for an undercut ledge on the left. Mile 8.6 - Take-out; Meral's Pool: This is the put-in for the run to Ward's Ferry.